I wake up at 5:00am on most days during the week, 6am on the others.. I have a glass of water and at least two coffees. My partner refers to my morning routine as my ‘huffing and faffing’ time. I see it as an opportunity to plan the day and get ahead. It’s an opportunity to be half a day ahead of everyone else as they get into the office at nine. My mornings are about planning the rest of the day and getting something significant done. Most days I will try to get out and do some exercise, I find it’s really the only good time to motivate myself to do something energetic. I love the freedom of running. It’s incredibly difficult in Phnom Penh as there’s hardly any space. I spend an hour or so writing Morning Pages in my Journal, expressing gratitude, capturing my mood, my plans and my aspirations. Journalling was something I picked up in 2013 after being given and reading the book The Artists Way at Work. Of all the exercises the book offered, that one stuck. I’ll try to get in 15 minutes meditation and then I get to work planning the day. This involves reading the e-mail highlights but generally not replying. I action some of the small tasks if I can, and then chunking up some of the bigger items. I will track and update progress and then move on to the bigger things. I’m generally quite hard on myself in terms of expectations of productivity. I then take breakfast around seven, shower and out of the door by eight if I’m meeting clients, or sat at the desk in my home office. I always try to make the bed before I leave the apartment. I see this as achieving a ‘small win’ early in the day. I’ve been doing this morning routine since December 2012 when I travelled to Hawaii. The rare bout of jet-lag kept forced me up at 5am. I found myself so productive during these early morning hours that I continued it during my stay and then reproduced the same environment when I got back to the UK. It’s remained pretty much constant, there are slight variations on what I do, dependent on where I am in the world, and I always said I wouldn’t read my e-mail first thing, but in terms of planning the day and knowing what’s happening with various clients its important to get an overview even if I don’t reply to the emails until later. I try to be in bed by 11 at the latest. I’ve learnt that good sleep is so important. My head generally hits the pillow and I’m out like a light. No, not really. We do a 10minute abs workout in the evening. My partner is keen to keep a fitness routine in her life and she’s never one for doing things on her own. My phone is set for the 5am early starts if it is dark outside. I’m a firm believer in being woken by the light. I worked with a client once who taught me about the benefits of being woken by the increase in light rather than the jolt of an alarm. I never hit the snooze button. My mind is way too active to go back to sleep. I generally have breakfast around seven. It varies between green smoothies, croissants, or eggs. 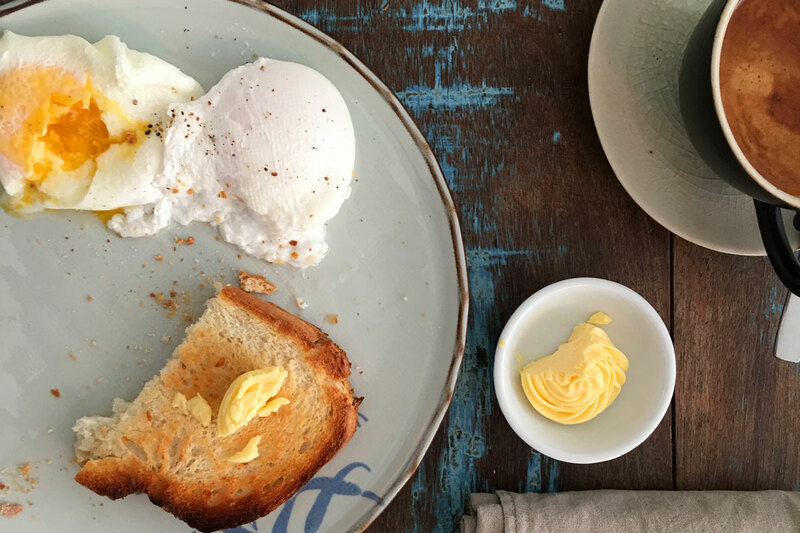 I love eggs, really love them, poached are my favourite. Not at the moment, but I’m trying the idea of getting out and running again. The roads are chaos here in Phnom Penh and it’s just too dangerous to run anywhere unless the roads are empty. There are no sidewalks/pavements and very little open space. In London, I run around Victoria Park and alongside the canal. There are many others doing the same. Yes, I like to do 15 minutes. I used the Calm App to learn about meditation and love the falling rain sound. It reminds me of time in our cottage in Czech. Recently I’ve given Headspace a try and quite like this App too. I read the important headlines but don’t reply until later. Being the minimalist, I tend not to clutter life with the unnecessary. There’s just the Calm App for meditation, (though I can do without it) and I’m briefly tried out Habit List to get me running again, but it failed miserably. Probably only before I leave the house or if I need to charge it. Thankfully I’ve not become one of the ever-increasing number of phone zombies. There are so many of them here in Asia. Drink coffee, drink water, plan the day. A glass of ice cold water, as soon as I wake up. Followed closely by black sweetened coffee. I don’t set an alarm for the weekends but still tend to wake with the light around six-ish. My partner used to be out of the door early on Saturday for art class and we swim first thing on Sunday mornings. It depends on where we are in the world, but generally, I stick to the same routine where possible. When we’re on holiday the exercise and breakfast timing may be influenced by our location. I’m a little obsessed by productivity, and I’m a firm believer that to fail to plan is a plan to fail. I find that the early morning is a chance to get ahead of the world and do stuff, while everyone else is still asleep. If I’ve achieved something significant in the morning, I feel so much better about myself. How to increase productivity with Noisli. Over the past few weeks I’ve noticed that I’m becoming more and more sensitive to noise. Obvious things like the chainsawing outside the apartment on Saturday you can understand, but I’ve also noticed that relatively quiet conversations in Impact Hub where I work are also distracting me. When I work I like the environment to be ‘right’. This way I find getting into flow, much easier and as a consequence my productivity increases significantly. More and more often however, I’m finding that wearing headphones and drowning out the external noise seems to be the only way. Right now I’m in the co-working space and drowning out everything with Spotify’s Discover Weekly. This morning I made one of those discoveries that just makes you jump for the ‘Buy’ button. I’ve been a user of Noisli now and then. I love the sound of rain and thunder, either natural or through Calm, my go-to meditation app. Today on Noisli I just pushed the random ‘Relax’ button and was greeted by a combination of the rattle of a carriage over railway tracks and a really low bass hum from a fan. The hum was perhaps a little high and I did wonder at first if this was in the room. A tweak of the volume levels down and I think I’ve found the perfect environment for productivity. Now I know it said Relax and not Productivity but each to their own. The bass drowns out the low distraction and the railway track clatter provides that comforting sound that allows you to ignore the outside world until the frequency changes, which of course it doesn’t. The never-ending train ride. So the temptation of having this on my iPhone was too good to miss, and £1.49 is hardly worth thinking about. The great thing is that when you sign up, the saved ‘combo’s’ sync between platforms. So that’s how I’ve covered a good chunk of client work and came up with the idea for this post and it’s only just lunchtime. Productivity at its best. For those who are interested, my combination of hum and railway tracks is available to other Noisli users here. 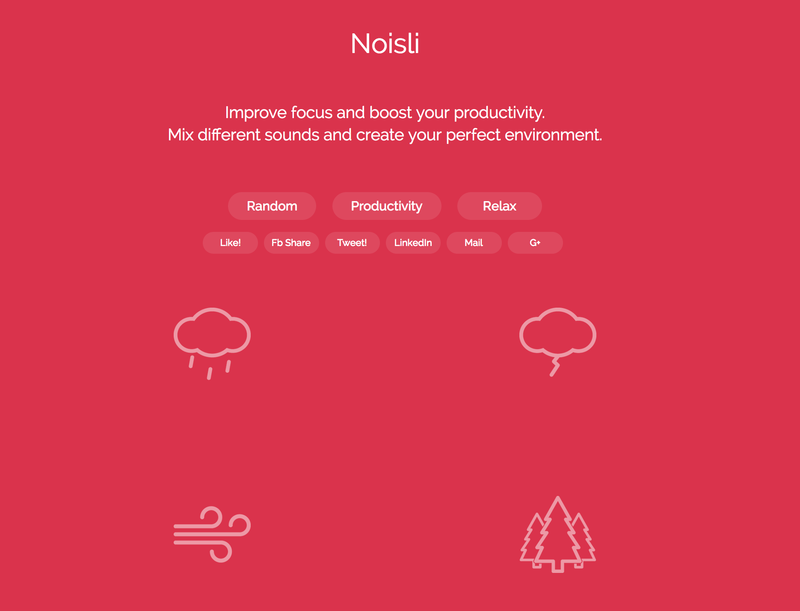 The post How to increase your productivity with Noisli, first appeared on the blog of Chris Wray. An open letter to my CEO. Entitlement, struggle, the right thing or the wrong thing to do ? A fascinating article I picked up when it was mentioned in the Fizzle.co podcast. The comments are as fascinating as the article. What is the real cause of a minimum wage job, is it just supply and demand ? Should we take more ownership for life, particularly when we’re young. Realising that actually it’s pretty hard starting out ? Are we blanketing millennials as having expectations that are just unrealistic ? You’ll find it all in this article. I met a really smart, well-qualified American this week, who kindly explained why he’s $200,000 in debt because he chose a good education. One day, and he’s not sure when, when maybe he’s not earning the SE Asia salary, significantly below that of US levels, he hopes to pay it all back. I thought UK students had a hard time with their average £30-60,000 student loans, but this is just a ridiculous amount of debt to be in when you’re only just starting out on a career. Another fellow mentor I bumped into recently is off to Harvard, where the course fees alone are $100,000. Personally I don’t think its worth the three letters after his name. So what’s the alternative ? Being an entrepreneur ? Those afraid of the above mentioned debt, who decide ( or are pressured ) into going into a solopreneur business as an alternative. Preyed on by the internet snake-oil sellers offering passive income by selling the expertise they can’t possibly have, because they’re just not old enough to have all that experience. They suddenly realise they are contractors not entrepreneurs and when the one client they have disappears, money runs out and they’re back to square one. Its a sad state of affairs, and I sympathise. I’ve spent more time on Netflix than I do normally. My partner has been away, I needed something to do. Watching Fat Sick and Nearly Dead, a film on health, while drinking beer and eating junk because I’m tired. I’m not setting a good example. The interesting story is that losing all that weight, being a role model, then piling a chunk of it back on again while being caught by the media just made the eventual crash all the harder. You can’t lose weight, and guess what, the underlying depression, on your own. We need support by our wider community. Men particularly it would seem. Can we stop telling ourselves we need to ‘Man Up’ we are men, we just need a bit of help and support, It’s these dreadful stereotypes that have become my pet hate since reading the Samaritans report. So while on my binge of diet based entertainment, last nights That Sugar Film an interesting look at ‘Calories are not the same’. My above mentioned binge on Coke of all things being the source of 7-10 spoons of sugar. Great for cleaning out the pipes, and a decidedly persistent dose of stomach upset. However, on the downside, it means that by the time the innards are sorted, you’re nothing short of addicted to the stuff, too tired to function and absolutely not picking up where you left off on exercise when you recover. In only a week, I put back my pizza belly and I was eating almost nothing else that could be described as ‘bad for me’. Definitely worth watching what sugar can do to you. No surprise that my only only intake today was a green smoothie and fresh vegetable dinner. My current client is occasionally happy for me to work from home when there are personal issues to attend to. This particular issue involved the dentist and some less than ordinary work. Implants. Nothing special about this, is there ? Well maybe, my client is UK based and my home this week has been Prague. Armed with WiFi, mobile, and a Skype number they can call a regular UK number and be connect to my laptop here in Prague. I’m really pleased with the call quality, better than most regular phones and certainly better than call from a UK mobile. Topped up with Skype credit and you can call UK numbers from your laptop too. This is very much a step from Tim Ferris’ 4 Hour Work Week, my bible on all things work related. With mobile data roaming on O2 costing only £2 per day, having all of your apps available, along with decent web browsing meant I could even check internal e-mail via the web browser. Coverage of course is a killer in whatever county you visit and a train ride into the Czech countryside meant a very slow data connection. All in all, successful trip with no issues at all raised by the client. They probably thought working at home meant a UK home. I really love to read about the lifestyles of others, how they’ve made changes for the better, and particularly if we can adapt these changes to our own lives. I thought I’d list some of my favourite lifestyle books for others to consume. You can buy Happiness, Tammy Strobel, who took minimalism to what some would call an extreme with her tiny house. I love a lot of things about what she did and I can really understand why they did it. I’m not altogether sure this is where my idea of minimalism is taking me though. This I know, Susannah Conway – A really rather interesting story of how a sudden death can have have both a negative and positive outcome and how it affects our lives as the healing process takes place. Anyone who’s suffered a sudden death of a loved one, or recovered from depression, will be able to relate to what she writes. I love the fact she’s a fellow Polaroid fan too, and the resultant photographs adorn the pages. The 4 Hour Work Week, Tim Ferris – I can’t remember how many times I’ve read this book, at least a dozen so far. I read it again while on holiday and to some extent its been a guide to me changing my lifestyle. Its full of real practical advice. 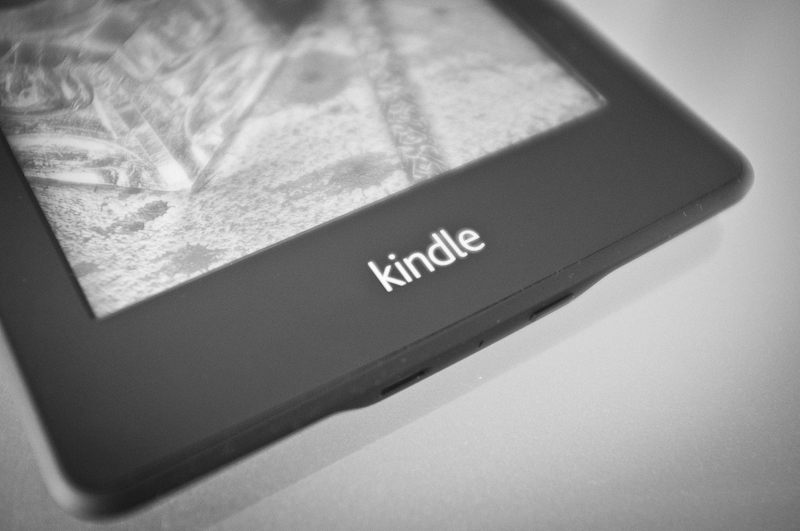 I ended up buying a number of kindle and paper versions and have given many copies to friends. The $100 Startup – Chris Guillebeau – Both my business partner and I read this without either of us knowing so. We found each other quoting ideas from it in a meeting shortly afterward. We both like the principles in the book and use many of them in our own business. I’ve very much become a fan of Chris and read his other book detailed below. The Art of Non-Conformity – Its another look at the alternative lifestyle and the prequel that led to the $100 startup. Written in a familiar language and capturing all the ideals and actions that inspire me. Be a Free Range Human – Marianne Cantwell, who shows you that you really don’t have to do the 9-5 and who coined the phrase portfolio career. I’d not seen this concept so well defined and wish this book existed when I was rethinking my own lifestyle decisions. Entrepreneur Revolution – Daniel Priestly – will probably sit in one of my all time lifestyle favourites along with The 4 Hour Work Week and The $100 Startup. I started reading this at about 7:30am one morning and had finished it by 11:20am, I just couldn’t put it down. There’s a great deal of lessons to learn and I wish I’d read when building my own business. I loved the practical exercises in the 10 Challenges, the building of the ATM model and the inspiration to just produce output and get work ‘out there’. In most cases I read the kindle versions, but given that I’ve read and re-read many of these books, I also ended up buying paperback versions too. I took time to work on Susannah Conway’s unravelling project and decided that this really is what’s important to me this year. For the last three days I’ve very much lived simply. I’m staying in a small house [link] at the edge of the Moroccan desert, and we’ve done the simple activities of walking, exploring, sitting on empty beaches, and reading, and writing my morning pages. I find it a great way to recharge, especially at this time of year. Not only does it fulfil my love of travel, but it allows me to completely disconnect. I’ve not used the internet for a week and I’ve had only a small number of text messages of festive greetings. I’ve slept like a baby every night, and given we’re eating only two simple meals a day, I feel as though I’ve lost weight too.